And that is the end of the live text on day two. This page will continue to run throughout the afternoon and evening with replays of today's action. You can watch by pressing the play button at the top of the page. We will have a live page published just before midnight for all the day three action, with programmes on BBC Two at 16:30 GMT and again at 19:00 GMT with some of the best action from Sunday before then. As always, thanks for joining us and for all your comments and pictures. See you again soon. 01:00-02:45: Snowboarder Aimee Fuller competes in the women's slopestyle final, but team-mate Katie Ormerod won't be there after suffering an injury in training on Thursday. 01:15-02:55 & 04:45-06:35: Skier Alex Tilley will make her Olympic debut in the women's giant slalom. 01:15-02:55 & 04:45-06:35: Day three will be the first opportunity to witness American skiing sensation Mikaela Shiffrin at the 2018 Games. Giant slalom gold at Sochi 2014 made her the youngest ever Olympic champion in the event and, in the years since, she has developed into a serious multi-event medal prospect. 12:30-14:10: Will this be the day that Ireen Wust becomes the most successful speed skater in Olympic history? Assuming the Dutchwoman has claimed a medal in the 3,000m on day one, another here would put her top of the all-time list with 10 medals - ahead of Germany's retired Claudia Pechstein, who has nine. Red Gerard might hog a few backpages in the USA after winning the men's slopestyle - his country's first gold of the Games. The 17-year-old said: "I feel awesome and so stoked about today. I cannot believe what has just happened - it is insane." Meanwhile, 19-year-old Perrine Laffont will be the toast of France after she won her nation's first medal in Pyeongchang with victory in the women's moguls. Aimee Fuller was meant to go today, but strong winds saw the event postponed, so she will have her Winter Olympics moment tomorrow. Britain have yet to win a medal at Pyeongchang 2018, but they came close in the men's skiathlon. Scot Andrew Musgrave was in second spot going into the final 5km of the 15km + 15km event, but eventually finished in seventh. It was the best ever result by a Briton in an Olympic cross country event. Elsewhere, team-mate Aimee Fuller reached the final of the women's slopestyle without having to qualify. The Briton, along with the other competitors, is in by virtue of bad weather forcing the cancellation of Sunday's qualifying. And in the men's luge, Adam Rosen finished 23rd overall and 20-year-old Rupert Staudinger was 32nd. Miss any of the action? We will be back on BBC Two at 16:30 GMT for some more action, and also again at 19:00 for Winter Olympics: Today at the Games. Day three's coverage starts on BBC One at 00:10 GMT on Monday morning. This is how things stand in the medal table at the end of day two. Eleven gold medals out of 102 have been handed out. Matt Bowden: Loving that I am cheering on an Austrian and an American who are throwing themselves down an ice-run feet first! LugeGB: Still haven’t recovered. I say again, Oh. My. GOD!!! Canada thrashed the Olympic Athletes From Russia team 5-0 in their match in Group A, to move above USA to the top of the table. Watch: Germany's Arnd Peiffer takes gold in the 10km sprint in biathlon. As all others around him faltered it was Germany's Arnd Peiffer who took gold. Watch the moment he found out below. Chris Roderick: Who knew that Luge could be so exciting. Miss F: Absolute drama in the Luge final. Cannot believe Felix Loch blew it! Congrats to the Austrian Gleirscher. Pippa Ainsworth: Blimey, that was thrilling! When not to make your only mistake of the week! Felix Loch was 0.2 seconds ahead before this. This clip of the wall means there is no third consecutive gold for the German. Devon Loch was the name of a horse in the 1956 Grand National, who was heading for the win at the famous race at Aintree, slipped 40 yards from victory to allow E.S.B to win the race. David Gleirscher was a complete outsider. Nobody had him down as a medal contender let alone a gold winner! He has had the week of dreams - quite extraordinary! What a moment. Germany are still on the podium but it is not Loch - it's his team-mate. You could see how distraught he is. He was inconsolable. Felix Loch - beaten. That is how defeat tastes. Crushing disappointment. Gleirscher hasn't even got a medal on the World Cup scene! And this is that moment that will haunt Germany's Felix Loch. He misses out on the medals to give Austrian David Gleirscher gold in the men's singles luge at Pyeongchang 2018. This was the reaction when David Gleirscher finished. At that moment he was only guaranteed a medal, little was he to know what drama was to come. And this was the reaction of Felix Loch when he finished. He clipped the wall, and that ruined his round and he dropped from first at the start of the run, to fifth at the end of it. Felix Loch is not the first competitor to miss out on a Winter Olympics gold medal when they looked on course for glory. In 2006, American Lindsay Jacobellis was leading in the women's snowboard cross event. But she started showboating, grabbed her board when jumping late on and lost her balance. She crashed and Switzerland's Tanja Freiden could not believe her luck and took the gold, before Jacobellis scrambled over the line for the silver. Watch Jacobellis' error, and all sorts of other crashes and dramatic moments from previous Games with our video below. The heartbreaking nature of elite sport. Felix Loch's father raced on to the track to console the German after his big mistake on the final run meant he does not pick up an Olympic medal in 2018. Some headlines for you from day two of the Winter Olympics. Great Britain's Andrew Musgrave finished seventh, the best performance by a Briton in an Olympic cross-country event, in the men's skiathlon. 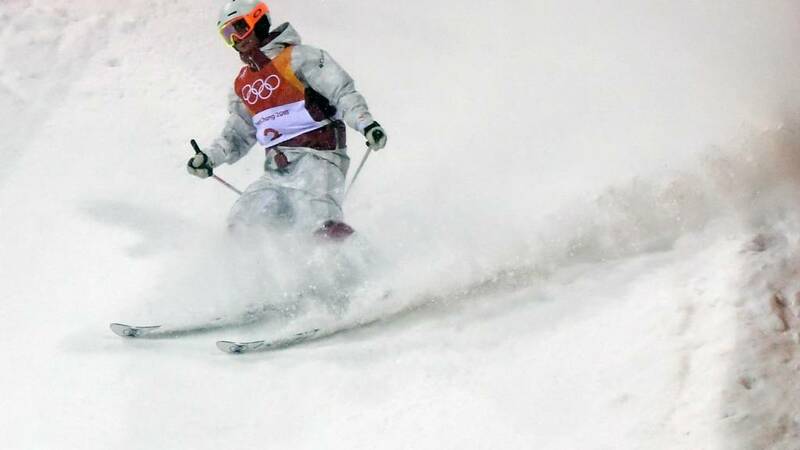 Norway's Simen Hegstad Kruger, who fell at the start, won the gold. Seventeen-year-old Red Gerard snatched a dramatic gold medal in the men's slopestyle to win the United States' first gold of the Games. The men's downhill was postponed because of high winds at the Jeongseon Alpine Centre, and will now take place on Thursday morning. Qualifying for the ladies' slopestyle, which was due to include Great Britain's Aimee Fuller, was also cancelled. All of the competitors will just compete in the final on Monday now. The speed skating - men's 5,000m final was won by Netherlands' Sven Kramer. France win their first gold medal of the Games thanks to Perrine Laffont in the women's moguls. David Gleirscher claimed Austria's first luge gold in 50 years after a mistake by Germany's defending champion Felix Loch on the very last run. We have some ice hockey action available on the Red Button.